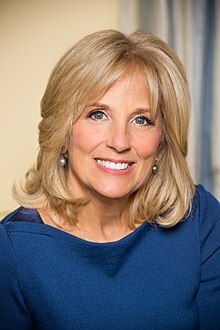 Jill Tracy Jacobs Biden (nee Jacobs, previously Stevenson) (born June 3, 1951) is an American educator. She is married to American politician Joe Biden. When he became Vice President of the United States, she became Second Lady of the United States. She was born in Hammonton, New Jersey. She attended the University of Delaware. She met Joe Biden in 1975. They married in 1977. In 1981, their daughter Ashley was born. Biden has taught high school for thirteen years. She has founded several charities. As Second Lady, she continued to teach part time. ↑ "RT @whitehouse Happy birthday, @DrBiden! - Take note @Wikipedia!". The White House/Twitter. June 3, 2013. This page was last changed on 21 January 2017, at 17:40.